Piano Duets – sociable, satisfying and sensuous? I have been enjoying piano duets over the past week; both four hands at one piano and works for two pianos. Piano duos can take two forms. Two pianists at one piano being the most popular i.e. the first player, or primo part, plays at the high pitched side of the instrument or the right side of the piano keyboard and the second player, or secondo part, plays at the low pitched side or left side of the keyboard. The second form allows each pianist to have their own instrument therefore it is a two piano combination. There are many great works written for both genres. Works have also been composed for three pianos (Mozart wrote a concerto for three pianos) and multiple pianos too (Steve Reich is a good example – he loved utilizing a huge piano sound using multiple keyboards). 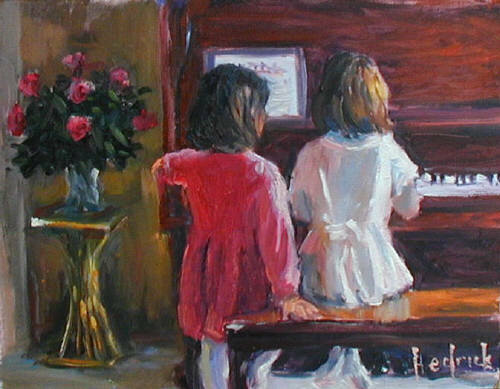 Duets can be a wonderful way to play music with a friend or a sociable way to improve your sight reading. They also allow pianists to get to know each other musically too making piano playing less solitary. If you are learning the piano and fancy exploring the four hand repertoire there are many publications available featuring graded duet selections. Some composers have written original pieces for varying levels of players too – from beginners to more advanced students. When I was studying at the Royal College of Music, my professor ran weekly sight reading classes enabling groups of six pianists to gather together and galop through various symphonies or opera overtures at three pianos (two pianists at each piano). It was such fun and not only did our sight reading improve considerably but we all got to know many orchestral works too. There is something very satisfying and sensuous about the rich timbre of several pianos reaching fortissimo in unison. Performing duet concerts is another matter entirely. I worked with another pianist for a few years and we regularly gave two piano and duet recitals. Ensemble can be tricky when two pianists play together and it does need lots of rehearsal but the rewards are great. There is a substantial repertoire and many composers have made a feature of writing for piano duos. Included in this group are Mozart, Schubert, Beethoven, Schumann, Liszt, Brahms, Dvorak, Debussy, Ravel, Faure, Bizet, Rachmaninov, Bartok, and Shostakovich. There are also many fabulous arrangements of famous orchestral works for four hands too. On about our third date, I brought a young woman to my apartment and she saw my piano (an ancient Steinway Model B with 85 keys that I had inherited from my aunt). She said she played too, and had been a music major in college. We sat down and started playing some duets (Schirmer’s duo piano arrangements of Mozart symphonies). After a while she said, “I know how to tune pianos too. I took a course in college.” At that point I thought — hmm — this woman may be serious marriage material. We were married ten weeks later — and we’re still happily married 21 years later.